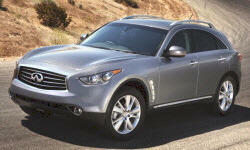 This member has purchased a 2012 Infiniti FX. Looking for a new (used) car when I return from Germany - there are several months to pin down something perfect. Something that is dependable so I can count on it for daily communiting, but something with enough brawn to handle weekend excursions into mud/gravel/snow for some hiking and skiing. Preferablly something with enough cargo capacity to run trips to home improvement stores. I do not have a family so rear seat room/3rd row seating is not important at all, but I prefer mid-size vehicles and do not enjoy compacts at all. I also would prefer not to have a full out truck, e.g. Toyota Tacoma. Any pointers, additional suggestions or recommendations are welcome! Wow, this is the most thorough, best-organized entry we've seen to date. I think you've nailed the cons of the contenders that should probably rule each of them out. The FX isn't practical or efficient, while the BMW and Mercedes are too likely to be troublesome. There's one possibility you haven't mentioned at all, so you probably have your reasons. 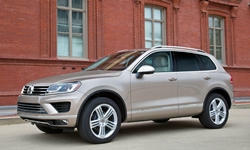 But given your criteria a VW Touareg TDI could be your best bet. We don't have a ton of data on them, but what we do have suggests decent reliability with the 2012 and especially the 2013. It helps that the Touareg isn't as complex as the BMW or Mercedes. Its structure is more solid than pretty much anything with a transverse powertrain, and a transfer case continues to be offered in Europe (but not here). Handling is more agile than more serious SUVs like the Toyota 4Runner and Jeep Grand Cherokee (which was glitchy for 2011 and again for 2014). With any of them I'd try to avoid the air suspension, as this tends to be a trouble spot in anything German (and the Jeep Grand Cherokee as well). The main thing lacking from the Touareg: an up-to-date infotainment system. Thanks Michael, appreciate the feedback. The Touareg did come up a few times in my research, and I think it strikes a good balance between utility and sportiness, similar to the X5 - however, both my SO and myself agree that the interior and exterior are plain ugly. The exterior looks like a bloated Golf and lacks any sort of personality, and the interior is just space of occupants. I'd like a car that is more than just a transportation tool and can bring a smile to my face every morning I walk out to it and get behind the wheels. 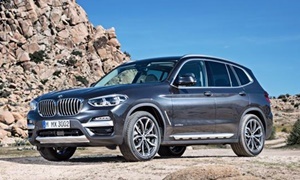 A perfect blend would be FX or X5's sportiness and looks, ML or X5's diesel brawn and capabilities for light-offroading, and FX's reliability... wishful thinking though. An X3 is definitely too small? It grew quite a bit with the 2011 redesign, but remains much more agile than the X5, and they tend to be more reliable than the X5 (though the 2012 isn't looking pretty lately). The 2013+ four-cylinder is fairly efficient. A Porsche Cayenne diesel would have the combination of sportiness and light off-road capability you're looking for, but I'm not sure about the reliability. And it's out of your price range. The FX might be sufficiently capable of light off-roading. Maybe ask owners in a forum? What your looking for probably doesn't really exist, unfortunately. The Touareg used to look better, but I don't think older ones are very reliable (typical for VW). The Audi Q7 would be nice (and I think it looks the best out of all of these), but reliability probably isn't its strong suit. I can't really think of anything that has AWD, reliability, and off-roadability. What are your thoughts on these cars? It does seem that way now - either way I look at it, I'm going to have to make some sort of sacrifice. If only the Germans got their reliability down right and roll out vehicles with less critical failures. All those three vehicles come with 3rd row seating, which I really prefer not to have, hence the reason I did not consider them. I like a comfortable amount of room inside my car (hence leaning towards mid-sized SUVs), but squeezing 7 seats into a mid-size just makes it a little claustrophobic in my opinion. 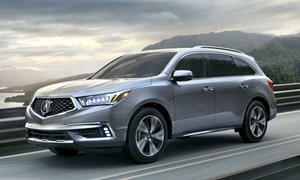 Otherwise the MDX would be my pick - it's got consistent rave reviews, excellent reliability and customer service (unlike some German brands), and the SH-AWD system should make it a pretty fun car to drive. 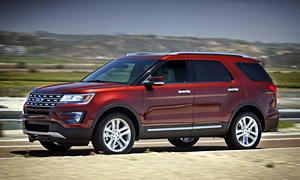 Fords are also looking pretty good nowadays too, although I'm not a big fan of the Explorer's exterior. The Edge does better in that regard, and the interior is beautiful, but similar to the FX it does not seem to fare well for light off-roading. Forgot to mention the Lexus's (Lexi?). 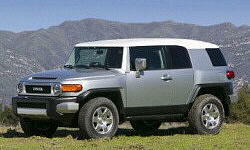 In my opinion the RX and GX have no character - they are simply reliable and comfortable people carrier. 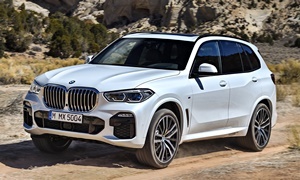 Same could be argued for Mercedes though, but after some research there are indications that both the GLK and ML are very very capable off-road (the GLK in particular) for vehicles that do not have locking diffs and low range, and the diesel in the ML appears to be pretty capable and torquey. It's just hidden behind a layer of complacency I guess. 95% of these Mercs probably have never seen unpaved roads though, so that makes it a plus buying used. And I'm also not a fan of Lexus's new constipated face look on their newer models. Spindle grille is what I believe they are calling it nowadays? The X3 is probably the largest in the compact bunch. I liked the GLK a lot better with the diesel than with the gas engine. You'll find a review linked in the "more about." The diesel engine suits its character very well. Definitely not as sporty as the BMW, though. 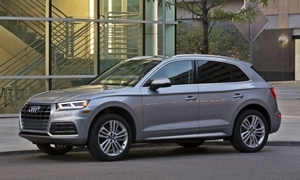 The Q5's diesel is smoother and stronger, since it's a six, but it's also considerably more expensive. The 2013 ML was offered in the U.S. with a full offroading package. No doubt very, very few were imported with one, though. And this package wasn't offered here with the diesel. I didn't suggest the 2014 MDX earlier because of the third-row seat, and because it seems a bit glitchy at the moment. Handles better than previous years and its competitors, though. 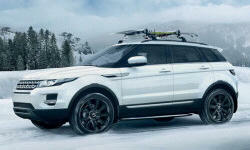 I'm surprised no one's mentioned the Evoque yet. Yes, it's on the small side, but I think it wins the Most Visually Striking SUV award hands-down. Furthermore, as a Land Rover it should obviously be fully capable of light off-roading even in its most basic form. I don't think you can find a new one for under $40K, but I would think a lightly used one would be obtainable in that range. Also, while Land Rovers aren't known for their reliability (and with good reason), any Evoque would still be under the original factory warranty. That said, may be too compact for your tastes. I'm also surprised no one's mentioned the Grand Cherokee. 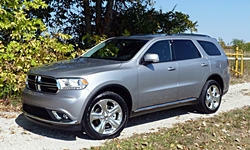 No, it doesn't have the reliability of a Japanese vehicle, but the current generation is the smaller sister of the already-mentioned Dodge Durango (which btw is a seven-seater and bordering on full-size). Both share a chassis at least partially derived from a Benz GL, from way back when DaimlerChrysler still existed, and in terms of interior and exterior quality, both are light years better than their predecessors (and IMO easily the best of any American SUVs). You should be able to find a loaded-to-the-hilt Overland model, which has by far the nicest interior design of the bunch, for under $40K if you look at 2012-2013 models. Finally, there's the FJ Cruiser, the cult car that Toyota has consistently sold in reasonably large numbers for six or seven years now -- with literally ZERO advertising or substantive changes to the vehicle. It's a Toyota, so obviously it meets any reliability standard; it's certainly striking in looks, albeit not in the same way as an Evoque or X5; and of all the models listed thus far, it will unquestionably retain the highest resale value. On the down side, it's a two-door (the only one on the market IIRC, except for the two-door Evoque variant) and somewhat compact on the inside, though I believe it has more interior space as a whole than, say, an X3 (and definitely more than an Evoque). But the MDX's seats fold flat, so wouldn't that be ok? It seems to be a really nice car. Thanks again for all the feedback - this is very very useful for my research to pin down the right vehicle. 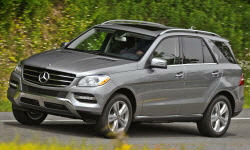 It looks like the GLK, X3 and Q5 are contenders now. The 2013 ML is a little out of my price range. The MDX's 3rd row is indeed a dealbreaker though. It's too much people-carrier utility and not cargo-utility. The Evoque is striking, and I definitely like a little personality in a car. However, as you mentioned, Land Rover reliability leaves a lot ot be desired. As far as luxury SUVs go, my personal opinion is the best way to get one is to get it used. You let the previous owner take the brunt of that huge initial depreciation, and costly issues will probably have surfaced. Service records and vehicle histories can also give you a clearer picture on the quality of that specific car. The Jeep does look promising - reliability is an issue though. However it might be worthwhile for me to do a little more research on it... Thanks for the tip. The FJ cruiser is too much offroad and not enough every-day driver in my opinion - it would be a perfect car (along with the Xterra) if I were to commute into the mountains every day of the week and have weekend excursions on the highway. The 2-door is not a dealbreaker though - the "utility" I'm looking for is simply light offroad capability and cargo capacity. There's no doubt that the MDX is a really nice car, but that 3rd row seating is a dealbreaker for me. I rather have that room occupied by the 3rd row seating be divided between cargo space and 2nd row seating. 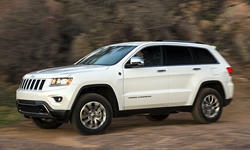 The 2014 Grand Cherokee got a new eight-speed automatic for 2014. Earlier years don't perform as well. The 2014 has been having many issues due to the new infotainment system (that is electrically connected to just about everything not powertrain). They'll eventually sort this out--but don't seem to have yet. We link to an active Jeep forum that's likely bursting at the seams with the details. The other reason I didn't suggest the Jeep earlier is that it feels large and heavy--but then so does the X5. And $40,000 doesn't buy a lot of a new 2014. Sounds like it's time to go drive a few. I'm looking forward to reading what you like and dislike about each. Just FYI, the MDX's third row folds flat (as does its second row, giving you 90 cubic feet of storage total). No one's mentioned it yet, but the RDX is comparable size-wise to an X3, but at significantly lower cost; you could buy a fully loaded 2014 model for under your $40K budget. It's pretty sporty as far as SUVs go; my mom has one (don't let that dissuade you - she always buys sporty cars), albeit oneof the last-gen models which had a turbocharged four instead of the current six-cylinder, and it handles and accelerates remarkably well. Regarding reliability: have you looked at this site's rankings? The X3 is pretty consistently mediocre in terms of reliability. Unfortunately Michael doesn't have any Q5 ratings up, for some odd reason (considering it's Audi's best-selling model), but the Q7 appears to have the singleworstreliability history of any SUV, which doesn't bode well for the Q5. Benz SUVs also have generally middling-to-poor reliability ratings, with the exception of the 2013 M-class (which may be an aberration - and btw Michael it should be listed as ML-class, not M-class). Meanwhile, the Evoque has one of the best SUV rankings of all, with the caveat of it having a small sample size (although its predecessor, the LR2/Freelander, also appears to be an exception to the general rule about Land Rover reliability). Consistently in the yellow! This isn't necessarily bad, depending on one's tolerance for one repair every couple of years. The 2014 RDX is also yellow because of a common problem with drivetrain vibrations. Replacing the driveshaft seems to fix this. I wouldn't put too much weight on that Evoque stat, very small sample size. Thanks for all the feedback - it's been really helpful. Based on the suggestions here and feedback to various makes/models, I did another set of research taking into account factors important to me and reliability from both this site and JD Powers (BMWs and Audis scored horribly there, Mercs fared a little better, Infinitis were way up there), I'll end up test driving the 2013 Infiniti FX37, 2011 BMW X5, 2012 Audi Q5 when I get back to the States. 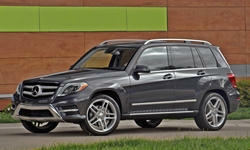 2013 BMW X3 and 2013 Mercedes GLK350 are backups. The Infiniti FX owners are oddly quiet about taking their rides for light off-roading, which makes me think this vehicle does not typically see much outside paved roads. Although based on the research everything weighs heavily in Infinit's favor - it also helps the closest dealership managed to pull off a large number of perfect reviews, the only negative ones I saw were from tougher reviewers that generally don't give out perfect scores. So they must be doing something right. Thanks again for all the feedback and suggestions! Car reliability surveys and dealer sales and service satisfaction surveys are two totally different things. Dealers rely on the big bonuses paid for high scores on the latter. They get nothing for high scores on the former. So the latter--conducted by the manufacturer--and the ones they press car owners for perfect ratings on. Sorry, didn't initially see the post that post was responding to. What site did you read the dealer reviews on? The largest one lets dealers who pay a sizable monthly fee screen reviews before they are posted. The dealers are then able to contact the person posting the review to "make it right." I tend to look at Google reviews first - those as far as I know don't get filtered, and I usually go through reviews from the most negative first. Those that are too "vague", e.g. does not mention specific car they were looking for/bought/service purchased, I disregard. Yelp is the next place I go to, but I know they aren't 100% neutral. Couple more sites after that like Edmunds and Dealerrater (I think this might be the one you are talking about? ), along with a couple more from a quick Google search. The approach I take is pretty similar to the approach you take on car reliability - if the sample is small, take it with a grain of salt. Why they rebadged every car in their brand to one of their least popular models I have no idea, but my perspective is that Infiniti is where Audi was several years ago, and they are at that stage where they're trying to establish their image as Audi did. While I agree the Q50 is a letdown (apparently lost Infiniti's trademark sportiness in favor of a more Lexus flavor, electrical gremlins, etc), I want to see the next set of vehicles before I pass judgement on them. The FX/QX70 is due for a redesign soon, and maybe the Q50 will be enough of a slap in the face for them to realign their vehicles with the brand image they're trying to promote. And while resale value is definitely important, equally so is the maintenance cost, and that's a difficult scale to balance. I will be getting a used vehicle, so even with extended warranty the car is not likely to be covered for the entire time I have it, and that's when reliability really kicks in. Just from this little research there are a lot of BMW/Merc/Audi owners claiming that systems start breaking down after the warranty period, leading to costly repairs - this would effectively negate any sort of resale advantages over a more reliable car, but less resale value. It's all a gamble - get a European car, hope it doesn't break after warranty's up and take advantage of the resale value? Or if something breaks, you lose the resale value advantage? Or get a more reliable car, save on repair costs, but if Infiniti doesn't gain foothold like Audi did, lose resale value? "Why they rebadged every car in their brand to one of their least popular models I have no idea, but my perspective is that Infiniti is where Audi was several years ago, and they are at that stage where they're trying to establish their image as Audi did." I'm guessing it has at least something to do with the fact that the Q was Infiniti's original flagship, designed to go head-to-head with the Lexus LS. The curious part is that they entirely discontinued it at *least* a decade ago. Also, Nissan in generation seems to be on some long, strange trip into mediocrity, with nary a single model (Nissan or Infiniti) that comes even close to leading its segment in terms of critical opinion. OTOH that hasn't stopped them from selling an absurd number of Altimas, but they're a long way from the days in the '90s when the Maxima was *the* sports sedan to buy (if you couldn't afford a BMW, that is) and the 300ZX Twin Turbo stirred the hearts of many a lad, myself included. "It's all a gamble - get a European car, hope it doesn't break after warranty's up and take advantage of the resale value? Or if something breaks, you lose the resale value advantage? Or get a more reliable car, save on repair costs, but if Infiniti doesn't gain foothold like Audi did, lose resale value?" I go with option #4: skip the gamble altogether and buy a new German car (or even a CPO one) with the six-year, 100K-mile extended warranty, and then sell it a little after the four-year mark (with enough time left on the warranty to keep your resale value intact). Sorry it took so long for me to respond - had to stay in Germany a little longer than originally planned so had to push back my purchase. I ended up purchasing a 2012 Infiniti FX35 AWD with Premium and Deluxe Touring Package. Fell in love with it after test driving it - except for the ride height, you honestly cannot tell you are driving a 5000+ lb crossover. Acceleration is swift, the car turns on a dime in a precise manner, and the engine note just begs you to floor it. Compared with rivals in the same year ranges, the interior is very very well appointed - there are subtle touches (like interior ambient lighting, the way instruments are laid out) that just makes it a very comfortable environment to be in. Cargo space is indeed smaller (feels smaller compared to the X3 even), but that's largely due to a high floor. One of the major factors I did not choose any German competitors is the reliability - I stalked owners' forums for the potential vehicles, and looking under the DIY section of a lot of the German brands, most of them are on DIY repairs, fixes, etc, whereas for the FX a lot of it are on mods and improvements. As one member of the FX forums pointed out, when your vehicle doesn't break down often you end up spending that money on mods. Interior definitely leaves something to be desired, and the gear selector just screams minivan the way it's located on the steering column. A lot more cargo room though. Very nice interior and exterior as expected, very fun to drive as well, but from the reliability perspective... I did not want to own one out of warranty. Great exterior, but interior feels like a VW. Very understated. Reliability seemed better than Bimmer and Benz.